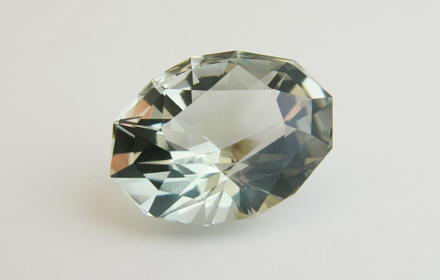 Weight: 13.65 ct; size: 18.60 | 13.96 | 10.68 mm; shape: oval; colour: light green; very slightly greyish; clarity: eye clean; cut: excellent; treatment: irradiation. Very clean specimen; excellent mixed style cut. Source: Jeffery Davies, Jeffery Davies Fine Jewelry & Gemstones.